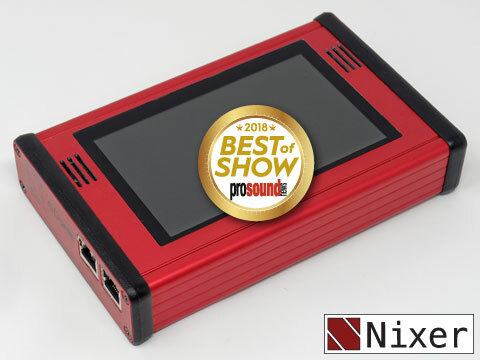 PD-Dante is a small portable monitoring and diagnostic system, which allows you to monitor or to listen into single or locally mixed Dante™ or AES67 streams. No matter if you are working on a broadcast application or at a live event, PD-Dante is a very handy tool for controlling your Audio over IP network. The user-friendly large 5“ capacitive LCD touch display shows all 64 channels with their individual routing to the L and/or R outputs, signal level meter and 0 dBFS peak indicator plus their channel name. It also displays serveral buttons for quick access of system settings and the Dante™ Network menu. The main output level (headphones, Line Out or AES Out) of the selected channel/mix is displayed on two large signal meters with overlayed level fader for attenuation. You can select any of the 64 possible Dante channels or create a user-definable mix of these channels via the capacitive touchscreen and listen to them via the on-board loudspeakers and headphone connector. The speakers are muted upon insertion of headphone jack. PD-Dante also offers one external stereo AES/EBU input plus a stereo line in and a microphone input to be assignable to any pair of Dante™ output channel. Dante™ channels can be sent to an AES/EBU output and stereo analogue line output (both located on the 15-pin Sub-D-type connector) of the PD-Dante. 8 sets of user memories allow you to store and recall your most frequently used PD-Dante monitor setups including channel focus setting with the option to auto recall a user selectable memory on power up.